(1) The release of the latest Freedom on the Net report, featuring the rise of fake news and increasing governments attempt to tighten control over netizens’ data. 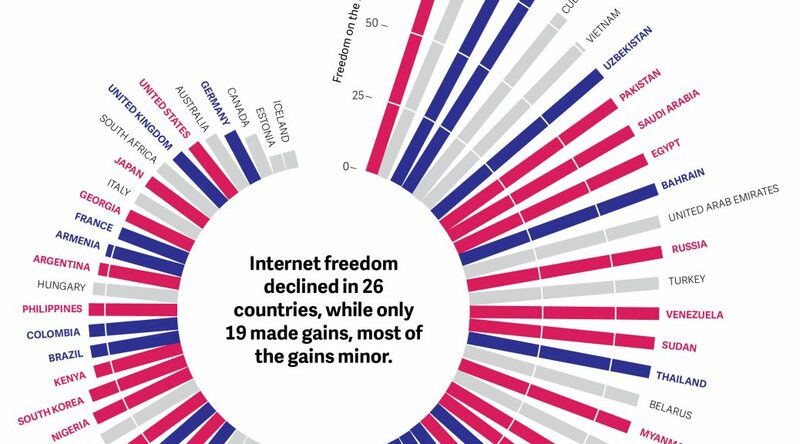 I work with Freedom House since 2015 on the section related to Internet Freedom in France. A hotly debated legislative proposal presented at the end of March would enable candidates to require judges to swiftly decide whether to stop the dissemination of allegedly false information online during electoral periods (see Media, Diversity, and Content Manipulation section of the report). For the second time in 2017, the Constitutional Council struck down a provision that criminalized the regular consultation of websites deemed to incite or glorify terrorism. On the other hand, users continued to be sentenced for inciting or glorifying terrorism online (see Legal Environment and Prosecutions and Detentions for Online Activities section of the report). While the prolonged state of emergency officially ended in November 2017, certain emergency measures were enshrined into ordinary law through the “Act to reinforce internal security and the fight against terrorism.” A provision obliging suspects to provide all their electronic identifiers to authorities was omitted from the final text (see Legal Environment section of the report). (2) I have been recently hired by the Sorbonne Business School (IAE de Paris) as an Associate Professor in Information Systems. I will develop my research on cybersecurity, cybercrime (of course! ), and Information Systems governance. Feel free to drop me an email at this updated address.